The Sportster 4 Person Runabout is a high-class premium marine quality water craft. 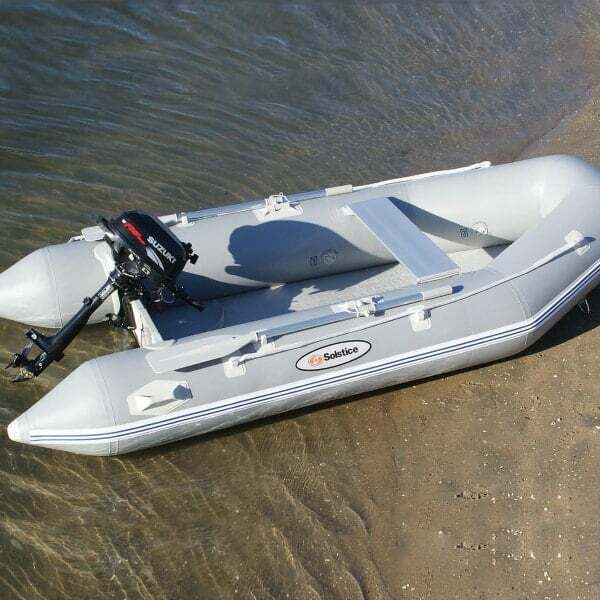 It is an inflatable boat, boasting superior flexibility in storage and transportation. The Sportster line from Solstice is one of the most durable and high performance lines, featuring enhanced accessories and a larger passenger capacity than many other Solstice inflatable boats. The Sportster has a passenger capacity of four people or 770 pounds. Seats are aluminum, so they do not rust and stand up over the test of harsh elements and use. The Sportster can run on either old-fashioned elbow grease or an engine of your choosing. There are swivel oar locks to keep ores in place and stored when in or out of use. Or, choose the engine route and add a gas or electric motor that is 4HP. Hook the Sportster up to your larger boat and tow with safe and heavy-duty “D” rings for towing or mooring. The options are endless. Imagine how you can put the Sportster 4 Person Runabout to use for you and yours. Note: Pictured Motor is Not Included. Dimensions 10’ x 4’ 7"